LONG ISLAND, NY, UNITED STATES, July 3, 2018 /EINPresswire.com/ -- Do you find yourself in a situation in which your child is not living with you full time? For a variety of reasons, this has become an all too common phenomenon. While adults often have the ability to integrate, or get help with, the problems of rebuilding their lives; more often than not, the children involved feel saddened and confused. BUT- what if there was a children’s picture book that would provide a means to help kids make sense of what’s happening to them and present an opportunity to discuss their feelings with you? In her book, Hannah’s Two Homes, author Melodie Tegay tackles these issues through the eyes of a child. 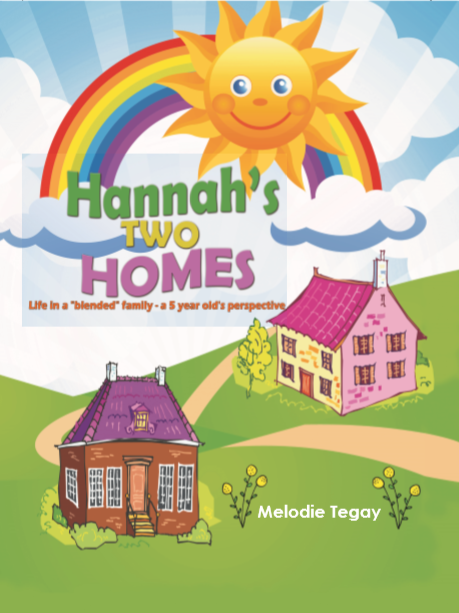 Meet 5-year-old Hannah, who is getting used to living in two residences; while simultaneously trying to fit into the dynamics of newly reformulated family structures involving step-parents, half-brothers, and half-sisters. Hannah “uses her own words” to share her thoughts and traces her progress through various emotions while remaining positive and upbeat. Ms. Tegay pens her characters with a light-hearted hand, and colorful illustrations. By using simple sentence structure, and easy-to-read vocabulary; she creates an opportunity for children, from pre-K through second grade, to better cope with this fragile, and sometimes anxiety filled issue. Born in New York City; Melodie Tegay is a mother of two children and a grandmother of 6, She is a retired primary school teacher with all thirty-three years in public education. Not finding any picture books or easy readers that reflected the often dissolved, informal, reconfigured, diverse, intercultural and interfaith families which a majority of her students came; she decided to write a book which addressed their reality. She currently lives with her husband on Long Island, New York.